At the end of each year, art lovers – enlightened or otherwise –powerlessly watch the never-ending battle of figures between sales operators. In an art world that constantly seeks success and records, this is a matter of the utmost importance, as is the Forbes World's Billionaires list – because we all know that art and finance are closely linked. So who'll be the winner in Paris this year? Has there been a shift in the game? Will the French capital maintain its position against its rivals? In this 2015 ranking, Drouot posts a comfortable result of €375 M, consolidating its status as France's leading sales marketplace. Christie's, with €234.1 M, is ahead of Sotheby's (€210.4 M) and Artcurial (€191 M), and well in front of Tajan (€37.5 M) and Piasa (€35.5 M), while Bonhams totalled €30.8 M, in only two sales. Apart from the figures, which tell us that Paris has maintained its ranking, displaying reassuring stability if not impressive growth, the Paris marketplace still boasts a speaking asset: diversity. 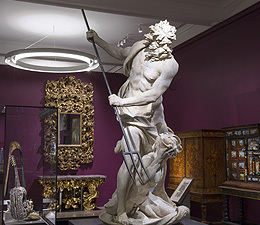 From vintage cars to comic strips by way of Old Master paintings and bibliophily (a speciality that positively dazzled at Drouot in December, thanks to the Pierre Bergé collection), the capital stands out vividly for the variety of its offering. This year, more than any other, Paris remains a moveable feast! The Victoria & Albert Museum needs no introduction – and its new rooms, devoted to Europe from 1600 to 1815, only add further lustre to the image of an institution rightly considered the world's greatest museum of art and design. "It's the most universal," says Olivier Gabet, the director of its Paris counterpart. "Its collections are truly phenomenal. It's the Musée des Arts Décoratifs de Paris with a bit of the Louvre, Guimet and d'Orsay museums and the Bibliothèque Nationale de France thrown in for good measure!" Throughout its history, the British institution has constantly expanded its collections, improved its presentations, and lavished care on setting and content alike. In 2001, it began a huge transformation project called FuturPlan. The second phase of alterations culminated in the opening of the Europe rooms on 9 December. This redeployment of the 17th and 18th century collections cost some £12.5 million. In France, the auction market stayed on course in 2015, and Paris even displayed excellent stability compared with other great world capitals. 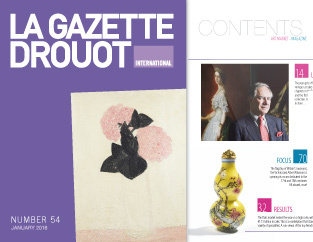 With a sales total of €375 M, Drouot remained the top French marketplace in 2015: a year marked by key specialities such as bibliophily (notably the Pierre Bergé sale), Old Master paintings and Asian arts. Once again, the French market stood out for the rich variety of its collections and wide range of specialities. See for yourselves! The first of six sales devoted to the dispersion of Pierre Bergé’s library made a total of €11,687,381 at Drouot (Pierre Bergé & Associés and Sotheby's), after an estimate ranging from €7 to 10 million for the 183 lots on offer. In a jam-packed saleroom, the bidding was fierce between collectors and professionals from fifteen countries and three continents, not to mention representatives of major institutions. Two dealers, the ever-present Jean-Claude Vrain and Jean-Baptiste de Proyart, walked off with numerous lots, the former finally garnering Sainte-Beuve’s copy of “Les Fleurs du Mal” with a dedication by Baudelaire for €280,350 after a high estimate of €60,000. "New Realism, new ways of perceiving reality". In 1960, Pierre Restany gave birth to New Realism through the almost mathematical formula quoted above. It appeared again in the preface to the catalogue for an exhibition held at the Apollinaire Gallery in Milan, featuring Arman, François Dufrêne, Raymond Hains, Yves Klein, Jean Tinguely and Jacques Villeglé. This booklet, presenting a small selection of works, is designed to enlighten our incomprehension when looking at contemporary Chinese creations. Through a few works chosen for their visual impact and expression of national cultural basics, we help you to crack the cultural code, because images made in the Chinese mould cannot be analysed without studying the specific features of this society and its languages.